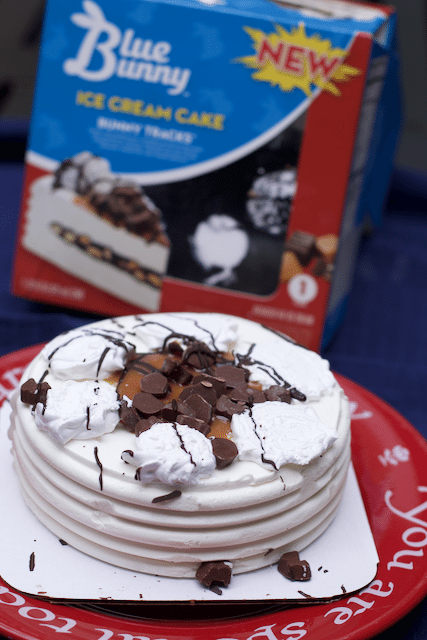 This is a sponsored post thru Savings.com and an exclusive Blue Bunny ice cream cake printable coupon! #CelebrateWithBB. 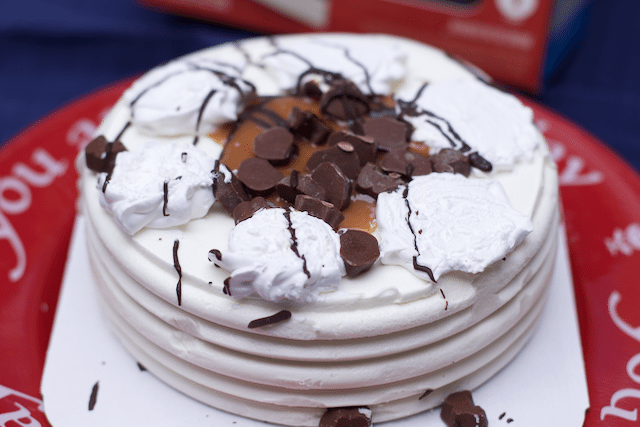 Bunny Tracks Ice Cream Cake For Any Occasion! Recently we made an amazing Chocolate Peanut Butter Pie using Blue Bunny Ice cream. Sometimes we don’t have the time or energy to make something from scratch. We have the solution for you. 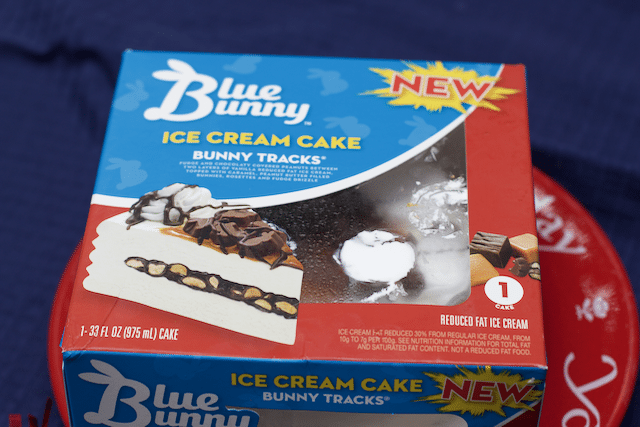 Did you know you can get the same great flavors of Blue Bunny Ice cream in a pre-made cake? We found two amazing flavors at our Walmart and wanted to share how delicious they were and how easy you can dress them up for any occasion. 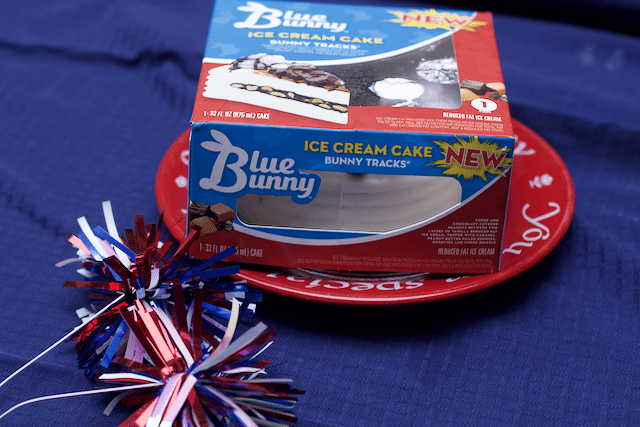 Whether you are celebrating a birthday or summer vacation, pick up one of these new Blue Bunny ice cream cakes and you have an instant party. I was tempted by the Bunny Tracks Ice Cream Cake but they also have a Vanilla Bean Blondie Ice Cream Cake version. I could not resist the caramel, chocolate and peanuts layered in low fat ice cream. Thought you might like to see a close up of what the ice cream cake looks like. 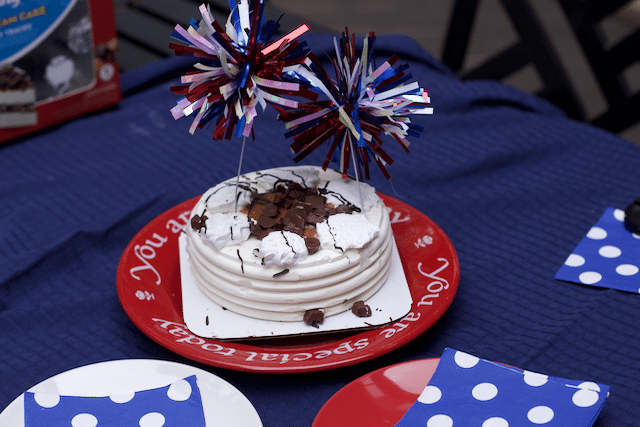 We will be celebrating the Fourth Of July with friends so we had a trial run and decorated the cake in with festive red white and blue streamers. My husband did not waste anytime and dug right into the cake. 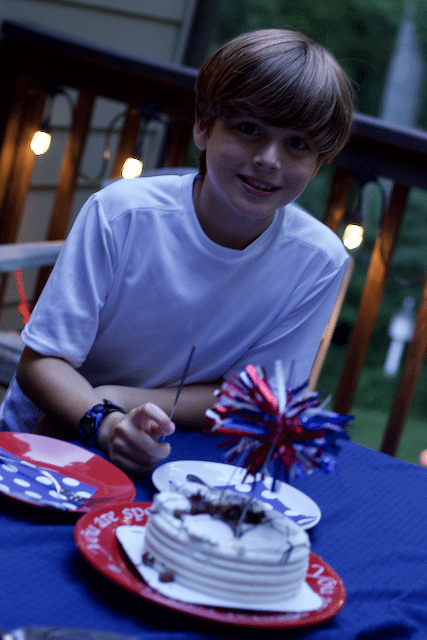 My son was more patient waiting for his sparkler to be lit and to enjoy America’s Birthday with a sweet summer treat. 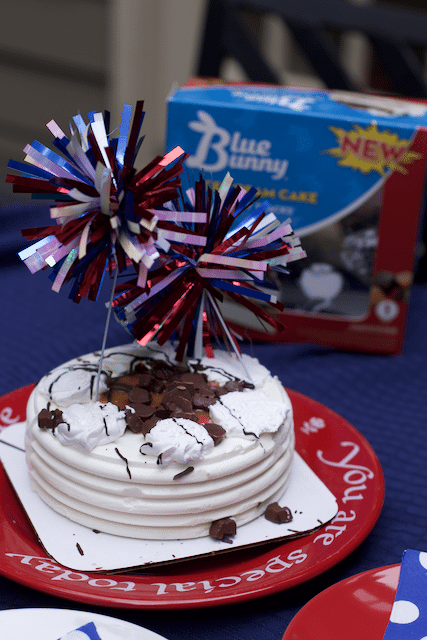 So grab a Blue Bunny Ice Cream cake, and gather around with some sparklers to celebrate anything really. Before you head out to Walmart to purchase your cake, print out this coupon to Save $3.00 on any one (1) Blue Bunny® Ice Cream Cake. Offer expires July17, 2017. Also check their Valpak envelopes to get an additional $3.00 off Blue Bunny ice cream cake coupon. Sorry the photo is not the best but if you are using sparklers it needs to be darker outside. You can still get the gist of the delicious layering of ice cream and fudge and caramel. Yum! I love Blue Bunny ice cream but didn’t know about their cakes. We will have to get one to celebrate my son’s birthday this weekend! WE love Blue Bunny Ice Cream, we have 3 cartons in our freezer right now. But I had no idea they had premade ice cream cakes available. I will have to look closer next time I go to the store! That is awesome! That would be perfect for an easy treat for a summer party. 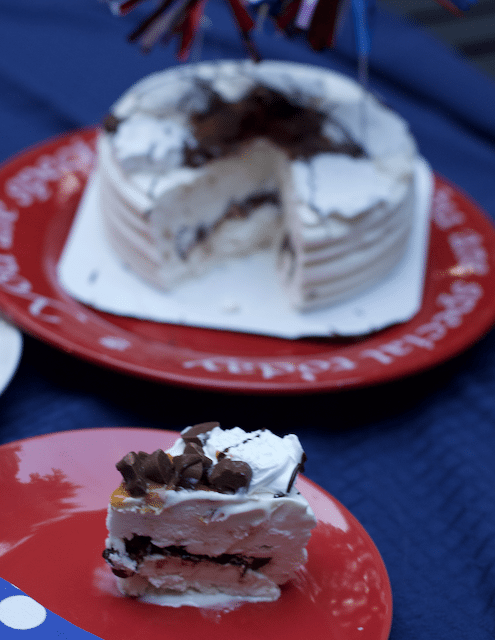 We love having an ice cream cake as a weekend surprise- I love that I can buy them at my local grocery store freezer! Yum! You had me at chocolate + peanutbutter + ice cream! 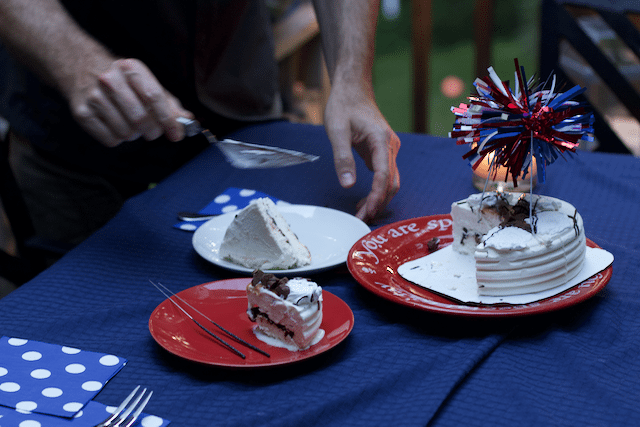 There’s nothing like an ice cream cake! 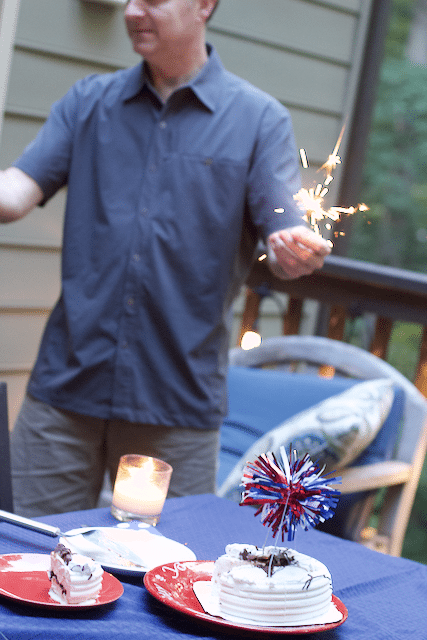 Those sparklers are an extra fun touch! Smitten!